If you’re plugging the word “Starbucks” into your GPS for your next caffeine fix, you’re missing out. Durham has some of the best coffee around, a lot of it roasted right here in Bull City. 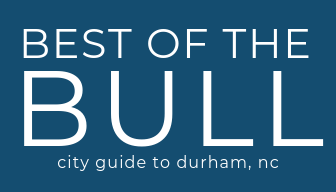 Do you know there’s even a few spots around town you can get free coffee with your Shop Durham card all year long? Yep, pretty awesome. All offers listed are for Shop Durham cardholders. Need your own card? Get one here for only $5 with code “BOTB” ($15 value) and a code for 20% off next year’s card. May not be the first place you think of when you want to grab a cup of joe, but the Durham Co-Op has a cute cafe that serves Counter Culture all day. So grab some fresh, local produce and stock up on your caffeine. Yep, you can get your caffeine fix at Locopops too. In addition to ice cream pops and water-based fruit pops, they also offer ice cream, pie and coffee. Bonus: There is a small kids play area! If you love coffee, you have to come here. No questions. Voted the best coffee shop in Durham County by Indy Week, Cocoa Cinnamon has 3 Bull City locations and each has their own unique character. Their coffee will rock your world and we love that they are so focused on community and environmentally friendly practices. Kaffeinate is such a quaint little Brightleaf-adjacent coffee shop with amazing coffee. ☕ Hand-crafted, unique drinks and plenty of outlets to set up shop for an afternoon.